Situations can change quickly in the football world. Three weeks ago I published an article “Can we believe under Mackay?” Latics had lost badly at Nottingham Forest and Malky Mackay’s record at Wigan was W1 D3 L10. Moreover the club seemed to be drifting with its talismanic leader, Dave Whelan, nowhere in sight. It was a club where leadership appeared noticeably absent. “Believing” was not easy. The weekend later Latics did inspire some momentary confidence with a 1-0 win at Reading. There were two home games coming up, so the more optimistic of supporters raised their hopes that it could be the start of a revival, although the battle-hardened contingent warned us to beware of a false dawn. The darksiders proved to be right as Latics lost to both Charlton and Cardiff. A failure to get three points in the next match at Blackpool would nail the relegation coffin for Latics, psychologically of not mathematically. The 3-1 win at Bloomfield Road was certainly a tonic, but unsettling rumours were starting to spread about the club being sold to Thai buyers. Still no word from Whelan. Moreover the next match was away at Norwich, who had won their last six games and were challenging for promotion. Within the space of a few days the future suddenly seems much brighter. DW stepped down as chairman, but made it clear that the Whelan family and Chief Executive Jonathan Jackson would continue to run the club. There would be no sell-off. Fans were debating the idea of Whelan’s 23 year old grandson, David Sharpe, taking over as chairman although the more savvy pointed out that Jackson was the pillar upon which the near future of the club would largely rest. The 1-0 win at Norwich, gained with just 32% possession, was precisely the kind of performance that many of us expected when Mackay was appointed. A gritty, backs to the wall display, based on strong defence and a moment’s inspiration from the excellent Kim Bo Kyung. Sharpe will surely have enjoyed overseeing a hard fought victory on receiving the reins from his grandfather. The mood is much more positive among the fans now. The team has won two consecutive games for the first time this season and people are seriously thinking whether they can once more “Believe”. The manager remains unpopular and Sharpe has a hard act to follow as future chairman, but there is at least something to look forward to now. The pundits tell us that Mackay’s current record of W4 D3 L12 – a winning percentage of 21% – lifts him above the level of being statistically the club’s least successful manager. He has certainly transformed things since his arrival. Not one of Uwe Rosler’s ten signings started the game at Norwich and only four of the eleven have contracts at Wigan beyond summer. At last he has succeeded into motivating the players to wear the Wigan Athletic jersey with pride, willing to give their all on the pitch. But there is a hard road ahead for both Mackay and Sharpe. After those consecutive wins the manager has regained some degree of credibility. However, he has incredibly still not won a match at the DW Stadium. He will be anxious to notch up his first against Leeds tomorrow. Can he lift his players to the same levels of energy and passion that they showed at Blackpool and Norwich? It will be a challenge to do so for the third time in a week. David Sharpe has been active at the club for over a year now. He worked with Mackay on the January clear-out and is likely continue to support the manager at least until the end of the season. 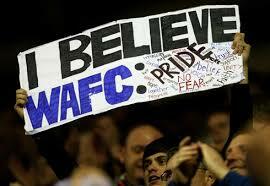 Questions remain whether relegation can be avoided and if Mackay is the right manager for Latics in the long term. However, there suddenly seems much more purpose at the club, following Dave Whelan’s announcements and a couple of good results. Let’s hope we can “Believe” in the Malky-Sharpy partnership.